The changing of hands at a global, historic brand like Balenciaga is a such a big deal, and the show was one of the most-anticipated of the fall 2016 season. Vetements has a very distinct trickle-up street look, iconized by oversized hoodies and influenced by the aughts. How would Gvasalia approach Balenciaga, a house known for the architectural but ladylike cocoon coats of its founder, Cristobal, and still supported in no small part by the recognisable motorcycle bag of Nicolas Ghesquière’s era? The first point of distinction came with the announcement that the show would be streamed in 3D, viewable online as well as by a VR headset-compatible app. While other brands have released their fashion shows and collection videos with these 360 videos, none to my knowledge have done that paired with instant streaming. Sadly, the feed didn’t work very well. 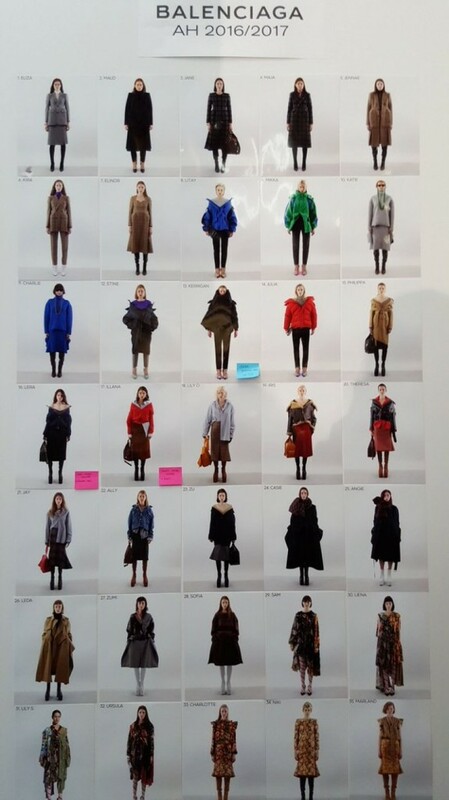 Twitter pictures and Instagrams from the front row were the most reliable first view of the looks. So, then, most importantly, the clothes. It really did appear to be a Vetements-tinged Balenciaga collection; but what would you expect? The proportions are excitingly exaggerated and there is a glamorization of blah, but essential, clothes like puffer jackets, but there still is a healthy respect for the Balenciaga house signatures. The level of proportion play varied greatly throughout the show. One third in to the 44 looks, we see an off-the-shoulder jumper with a traditional-enough trench cinched at the waist, and a slim mid-length skirt. Three models later, we have a cartoon-large men’s shirt half-tucked in to a calf-length tulip skirt. Almost all of the outerwear, including protective winter styles, were worn off-the-shoulder, with riffs on familiar jackets: jean, moto, trench, ski. Gvasalia, who has also designed for Louis Vuitton and Margiela to name a few, put out a fair amount of suiting on the runway, a category he played with at Vetements for the first time this season. The opening look was a dull grey, two-button blazer with a molded peplum and a matching, knee-length skirt with a slit that ended somewhere above where the jacket hit. There were a ton of floral dresses, patching together different flowers and styled with candy cane tights. As for accessories, there were everyday-looking bags in the front half of the show, in muted navy, olive, burgundy, and camel leather. The later half featured supersized totes — like Ikea shopping bag-big. Glossy, thigh-high boots in purple and black, as well as printed floral, lets face it, will probably be commercial hits; those clunky platforms I am sure will also win some hearts too. It wasn’t the typical glamour or splendor expected from Balenciaga, but neither of those things are particularly “in” right now, anyway. It’s a casual, quiet moment where a brand like Vetements can peddle hoodies that cost a G; now Balenciaga can sell puffer jackets for three G’s. This entry was posted in PFW, Trend Reports and tagged Alexander Wang, autumn winter 2016, aw16, Balenciaga, Demna Gvasalia, paris fashion week, pfw. Bookmark the permalink.